In January 2018 I went on a cruise in the Caribbean. The main reason for me to go on a cruise was to see several of the island nations. This doesn't seem feasible by air, so I decided on a cruise, even though I am not a cruise person, I am too active for that. I certainly didn't want to go on one of the huge cruise ships with thousands of passengers, so I decided on a sailing ship cruise with Sail Windjammer on the S/V Mandalay. The S/V Mandalay is a 236 ft (72 m) three mast schooner rigged sailing ship. She was built in 1923 in Copenhagen as a pleasure yacht for E. F. Hutton. It now has 29 cabins, holding 58 passengers, and about a 24 person crew. The cabins all have two bunk beds and in-suite bathrooms. The accommodations were very nice for a small ship. The dining area was plenty large for the 28 passengers on the cruise. It would be very cramped with a full complement of 58 passengers, they would probably have to do two shifts for dining. The food was generally pretty good. We had breakfast (which I skipped, I need to watch my weight), lunch, an afternoon snack, dinner, and then popcorn as late evening snack. Early morning, before breakfast they served Bloody Mary drinks (I didn't try them so I don't know how good they were). With the afternoon snack they served Rum Swizzels, a fruit punch with Rum. For dinner they served a glass of wine. The beer was pretty expensive, $4.00 for a 250 ml (8 oz) bottle. For every leg of the trip, the S/V Mandalay raised sails, even for the shorter relocations. A few of the male passengers (including me) helped to pull up the sails. Normally, they raised two or three of the jibs, and two of the main sails. But that is still quite a bit of pulling to get all these sails up. It was fun to help with that. 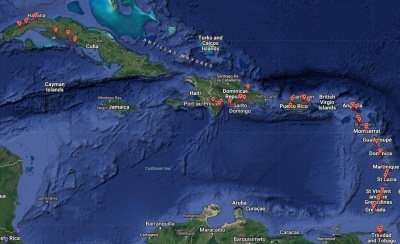 The exception was the last sail from St. Barths to Sint Maarten. On that sail they raised all the sails on the three masts of the ship. Every morning after breakfast was the captain's briefing. It was a kid's show for 10 year olds, complete with squeaky voice and clownish dancing around by the captain, and other "funny" stuff. It was absolutely ridiculous. There was not much entertainment on board (unless you count the ridiculous captain's briefing). On one day they had a crab race, where they have nine land crabs that they put in a circle on deck. The crab that firsts leaves the circle wins. It was actually somewhat amusing. The other entertainment was the S/V Mandalay Masquerade, which I did not attend, I am not into that kind of stuff. There were 28 passengers on this cruise. They were almost all old folks, 65 ± 10 years old. Many of them were not very active, they were more interested in doing nothing, laying in the sun, or eating. A majority of them had been on this cruise before, so they didn't want to go on any of the excursions. There were a few who were more active and regularly did go snorkeling. I flew into Grenada, with a two-night stop in Trinidad and Tobago. The cruise started in Grenada, we embarked around 17:00 and set sail in the evening for the first overnight cruise to Carriacou, still part of the country of Grenada, where we stayed for the day. In the morning we anchored at Sandy Beach, a small sand island with some snorkeling. Then we relocated to Hillsboro on Carriacou. Carriacou was the first island where a land excursion was canceled because of lack of participants. 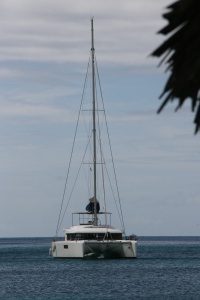 In the evening we sailed to Union Island in Saint Vincent and the Grenadines. In the morning we had a nice hike around part of Union island. That was the only hike with passengers on the cruise. 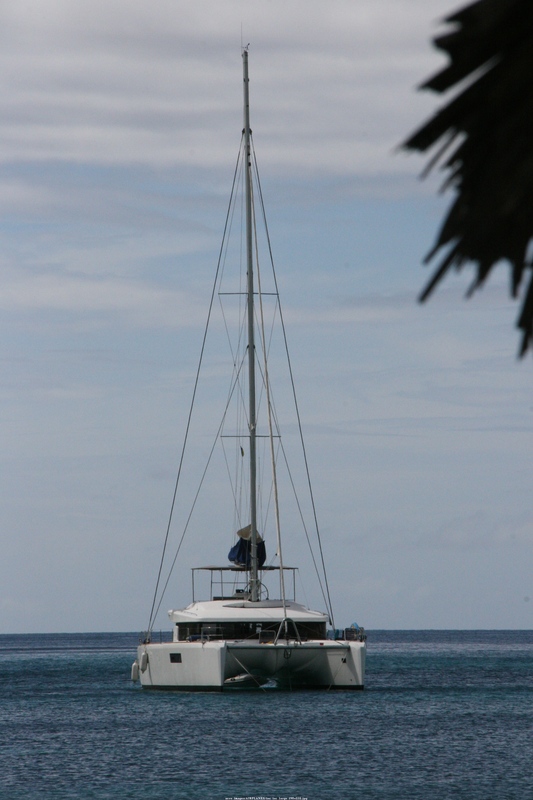 In the afternoon we relocated to Mayreau, Saint Vincent and the Grenadines. There was decent snorkeling at Mayreau. In the evening we had a pub crawl, which was nice. Overnight we sailed on to the Tobago Cays, Saint Vincent and the Grenadines, where we stayed off Petit Rameau. Snorkeling per see was not great, but we saw several Hawksbill Sea Turtle (Eretmochelys imbricata, german: Echte Karettschildkröte, french: Tortue imbriquée), which was very nice. We also saw a bunch of Southern Stingrays (Dasyatis americana, german: Amerikanischer Stechrochen, french: Raie pastenague américaine). They congregate in the area where the food vendors on the island clean their fish and dump the garbage. Overnight we continued on to Canouan, Saint Vincent and the Grenadines. There was nice snorkeling at Canouan, and a land excursion, though one of the less memorable ones. In the afternoon we sailed to Bequia, Saint Vincent and the Grenadines, where we stayed the next day. The land excursion on Bequia was OK, nothing really exciting. The one interesting item on the excursion was the visit to the Old Hegg turtle sanctuary, where an older gentleman collects eggs from Hawksbill Sea Turtles (Eretmochelys imbricata, german: Echte Karettschildkröte, french: Tortue imbriquée) and raises them till they are about 5 years old, then releases them. Overnight we sailed to Saint Lucia. This was a wild ride, the seas were quite heavy. On Saint Lucia we had another land excursions. This one was more interesting, with a visit to a nice botanical garden near Soufrière. We also visited a volcanically active area with fumaroles and mud puddles. In the afternoon we relocated further north on Saint Lucia to Castries. The next day we relocated further north on Saint Lucia for some snorkeling. Overnight we then sailed to Dominica, one of the longest sailing legs. On Dominica they had two excursions, of course the one that I would have been interested in was canceled because of lack of participants. The other excursion was OK, we visited some waterfalls. Dominica was devastated by hurricane Maria on 18 September 2017. There was still widespread damage when we visited. Many houses were still covered by blue plastic tarps because their roofs had been damaged or destroyed. They are having a hard time recovering, since this small nation doesn't have resources to pay for recovery. Overnight we sailed on to Terre-de-Haut, a small island off of Guadeloupe, a part of French overseas possessions. I walked around town and up to Fort Napoléon. This fort is one of the nicer ones on the Caribbean islands. Overnight we sailed north to Montserrat, a British overseas possession. Montserrat was severely damaged by hurricane Hugo in 1989, with 20% of the buildings destroyed, and 50% severely damaged. Six years later, on 18 July 1995, the volcano on Montserrat erupted. It ended up destroying and burying Montserrat's capital Plymouth, and forced all but about 1,200 of the 12,000 inhabitants of Montserrat to leave the island. By now the population is still only about 5,000. A land excursion showed us the buried capital. There is an exclusion zone in the southern part of the island because of the danger of the volcano. Some tours can get special permissions to enter the exclusion zone. It was eerie to see the buried city, with buildings buried two stories deep. The economy of Montserrat was devastated by the volcano. Montserrat's only export is now aggregate volcanic material for construction. The last eruption of the volcano was in 2010. During the next night we sailed to Nevis, one of the two main islands of the country Saint Kitts and Nevis. The excursion on Nevis was a trip all the way around the island. It was one of the more expensive excursions, but not one of the more interesting ones. The exception was the botanical garden around one of the hotels, it was quite impressive. Some of the churches on Nevis date back to the 17th century. What surprised me a bit was the fact that Nevis is full of sheep and goats. They roam the streets everywhere. Nevis has some expensive real estate. If you buy a villa that costs more than $250,000, you automatically get citizenship in Saint Kitts and Nevis. The next overnight sail was to Saint Barthélemy, part of the Guadeloupe overseas possession of France. St. Barth is a resort for the super rich. There were several mega yachts in the port. The excursion on St. Barth was another one that was canceled. I don't know whether there is really much to see on that island, I don't think it is worth a visit. In the afternoon we set sail for the last short cruise to Philipsburg, Sint Maarten, our final destination. This island's southern part is Sint Maarten, a Dutch overseas possession, while the northern part is Saint Martin, a French overseas possession. It is the smallest island in the world that has two countries on it. From Sint Maarten I flew back home, with a two-night stop in Puerto Rico. Many of the islands are in principle very similar, with modest mountains in the center, mostly volcanic. They have an Atlantic side and a Caribbean side. Because the prevailing trade winds blow east to west, the Atlantic side is the windward side with usually more wave action. We noticed that when sailing. When we were on the west side of an island, the water was generally calmer. When we crossed the straight between two islands, the sea got much rougher. One thing that was very noticeable for me were the houses. On most of the islands the houses were very colorful, not just white with red roofs but painted in all colors of the rainbow. Basically all of them had fairly protected bays that were used as harbors, many of the bays with protective forts at the entrances. They are quite scenic, but all very similar looking. I didn't get any experience with the local food, I always ate on board the S/V Mandalay. Did it work, did I get something out of the cruise? I did see several of the island nations as I had hoped (see below). But it also reinforced that I am not a cruise person, it was mostly boring, although not quite as bad as the Nile cruise in Egypt a few years back. Some of the snorkeling was OK. A few of the island excursions were interesting. But many of the excursions were pretty boring, how interesting is it to see an abandoned casino, or a fancy resort hotel? What was worse, four of the excursions were canceled because of lack of participants. I was going to say that it was the last cruise I ever do, but I may have to bite the bullet one more time. I want to see some of the glaciers in Alaska, and that is best done on a cruise ship. Following are the links to the pages for the various islands in the order in which we visited them. I have two separate pages for pictures of birds and reef life.